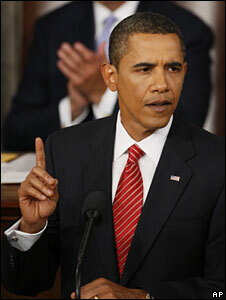 That is what the New York Times' Maureen Dowd said Barack Obama needed to show in his all-important address to Congress. He has tried using his Spock-like powers of logic, reason and argument to persuade the public to back his precious healthcare reform, but so far it has not really worked, hence the need for the kind of fight-back and grit personified on screen by Sylvester Stallone. The reality is that the president needed to show both passion and force of reason in his speech. To Congress, he needed to show political resolve - that he was determined to press ahead with his healthcare reform. But he also needed to explain to the public, in a calm, reassuring manner, what those reforms entailed and to add clarity - something he has not really done so far. Some opinion polls show the public is now more confused about what is being proposed than they were several months ago. The town hall meetings held up and down the country over the summer have shed plenty of heat, but not much light. While Democrats have been greeted by angry crowds and howls of protests at those meetings, the president received cheers and applause when he entered the House of Representatives. You would hardly guess that his approval ratings have taken a tumble. Mr Obama has made much of his desire for a new kind of politics. But when he is under attack he is still willing to give as good as he gets. Mr Obama quickly made clear his determination: "I am not the first president to take up this cause, but I am determined to be the last," he said. He set out the failings of the current system in vivid terms. He described how one Texas woman - about to undergo a double mastectomy - had had her insurance policy cancelled because she had forgotten to declare a case of acne. "No-one," the president said, "should be treated like that in the United States of America." He warned of the spiralling costs - repeating the fact that America spends one and a half times more per person on healthcare than any other country. His arguments in favour of changing the current system were strong and undeniable. And the president's proposals for reform appeared reasonable. He said he was taking on ideas both from Republicans and Democrats. "We are not starting from scratch," he said. Individuals would be able to keep their existing insurance schemes. As for the much-debated "public option" - what some Republicans call socialised medicine, Mr Obama made clear he would support it. But he added that it was only "a means" to the end of making coverage affordable, and that lawmakers "should remain open to other ideas that accomplish our ultimate goal". In other words, he realises it may not have enough support to get through Congress. But his efforts to reach out to the other side seemed to be undermined later in the speech. He took on some of the claims of his detractors - that his reforms would lead to "death panels". "It's a lie, plain and simple," he declared. And he went on to deny claims that he wanted to insure illegal immigrants. 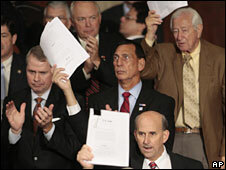 At this, the Republican ranks grew restive - even mutinous. One Republican shouted out "It's a lie!" while the president was in mid-flow. Democrats looked thunderous - this was not the kind of polite hearing a president usually gets when he addresses both houses of congress. In fact it does not even happen in the British House of Commons. And it may backfire on the Republican concerned. President Obama was clearly not looking for right-wing Republican support - he knows he will not get it. But he was hoping to win round sceptical conservative Democrats and independents - could some of the political point-scoring have put them off? The speech may have also come too late. Positions are now deeply entrenched. Some of his supporters wonder why the president did not do this months ago. There is no doubt that Mr Obama's rhetorical skills have helped him in the past, and will again. This was not as billed: a make-or-break moment. It was more an opportunity to try to turn the tide. This speech was another strong performance. Towards the end Mr Obama pulled at the heartstrings, invoking the memory of Edward Kennedy. With the senator's wife Vicki in the public gallery, Mr Obama read out a letter that the dying Mr Kennedy wrote. The letter talked of healthcare being "above all a moral issue" that defined the character of the country. For those millions of admirers of Senator Edward Kennedy it was a rallying cry. But do not forget the millions of Americans who were turned off by the Kennedys. They too have a voice in this debate. And the president's speech will not be the final word.